This major international conference at the National University of Ireland Maynooth, near Dublin explores Marx and Engels’ far-reaching different contributions to analysis and political practice, the ways in which their lives and work helped shape history and culture around the world, the many different strands and meanings of “Marxism”, and how we can understand the legacy and ongoing relevance of Marx today, in a world which has changed so much but which – as many have commented in recent years – he would have had no difficulty in recognising. CCQO member Lara Garcia Diaz has been invited to present her paper on the 4th May 2018 titled Precarious revolutionary agencies in common: beyond the Proletariat and the Precariat. 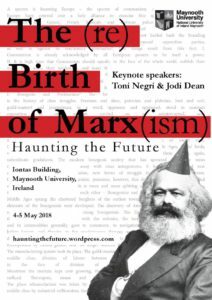 The conference also counts with Toni Negri’s and Jodi Dean’s keynote. The organising committee is made up of (alphabetically) Colin Coulter, Laurence Cox, Fergal Finnegan, Sinéad Kennedy, Chandana Mathur, Conor McCarthy and Eamonn Slater, representing a range of academic disciplines, Marxist traditions, political affiliations and none. The conference is supported by the departments of Anthropology, English, Geography, Philosophy and Sociology at Maynooth University as well as by the Dean of Social Sciences, MU’s Conference and Workshop Support Fund and the Sociological Association of Ireland. It is also supported by MU as part of the MU Commemoration Committee 2018 Programme.